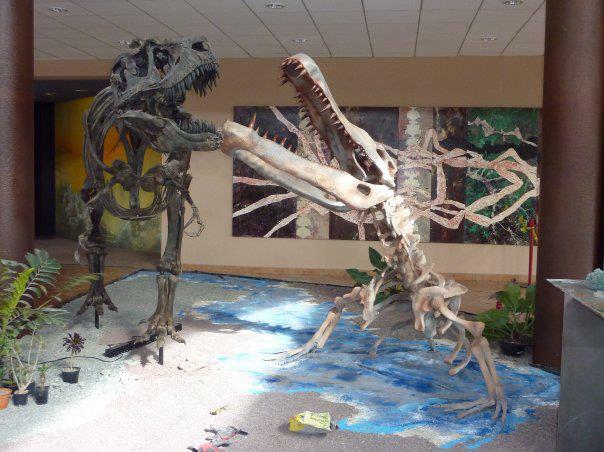 Yesterday I blogged about the newly mounted Deinosuchus displays in Mexico by my friend Héctor Rivera-Sylva. Today rather than the mounts themselves I’m putting up some of Héctor’s photos of the creation of these mounts. 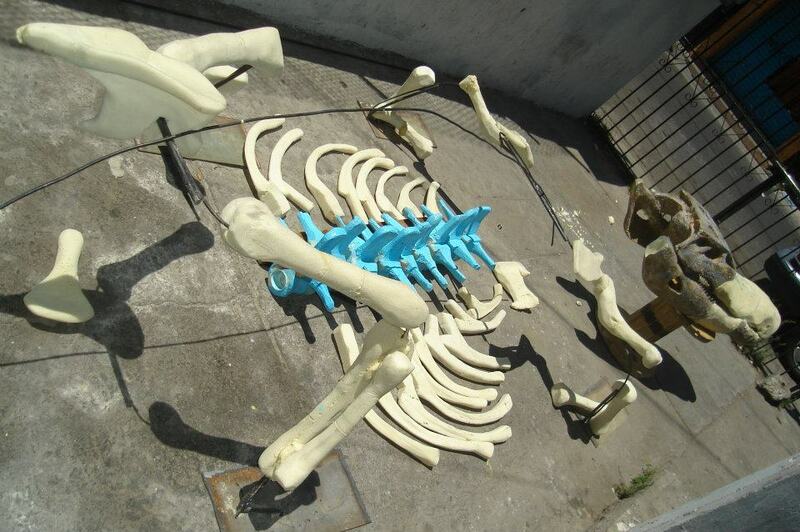 The bones are a combination of casts from multiple different individuals (as can be seen by the two different colours of material used in putting the skull together for example). While I provide no detailed commentary (as well, I wasn’t there) all the more obvious issues when making something like that are illustrated – sculpting, test mounting, painting and the like and I think it’s fairly clear to see the major processes at work. My thanks again to Héctor for letting me use these. Very longtime Musings readers will remember I had a lovely autumnal trip to Mexico back in 2008. While I traveled around a bit, this was based at the Museo del Desierto in Coahulia. I still have friends there, and indeed one before I went – Héctor Rivera-Sylva was doing his MSc in Bristol when I started my PhD and we’ve been in touch ever since. 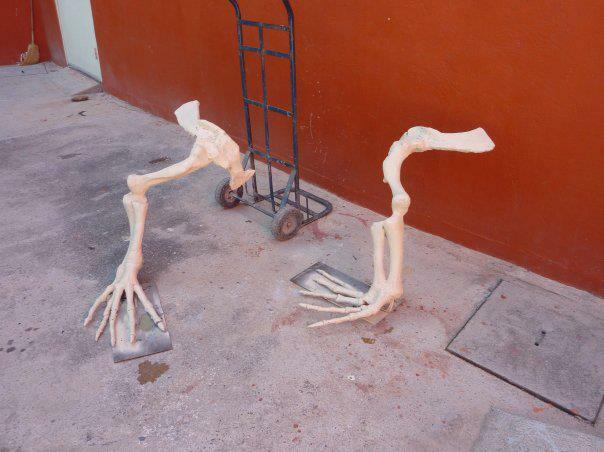 In fact we have just had a paper accepted on some local (to him) dinosaur specimens. 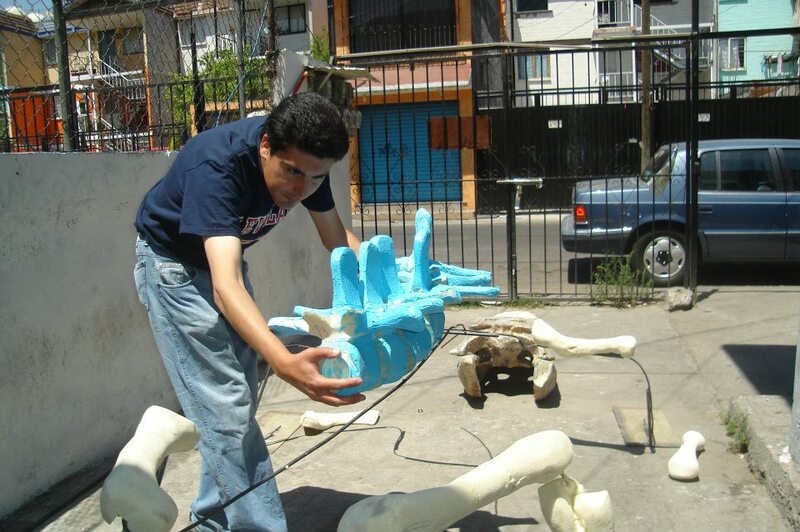 More of that soon, but today I’m looking towards Héctor’s most recent project on Deinosuchus. As big and badass crocs of the Mesozoic go, Deinosuchus seems to play second fiddle to Sarcosuchus. Despite the impressive size of the latter, it’s hard not to look at it and think that the skull is at least superficially gharial-like and really rather narrow for much of it’s length. Deinosuchus on the other hand appears to have both sheer size and a real set of ‘proper’ crocodilian chompers. 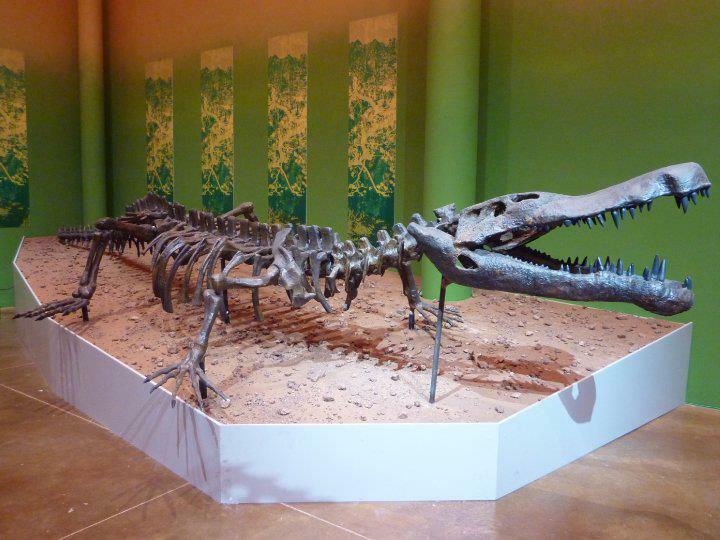 Héctor has described some new Deinosuchus material from Coahuila (shown above) and clearly they felt it was time to give this animal it’s dues. 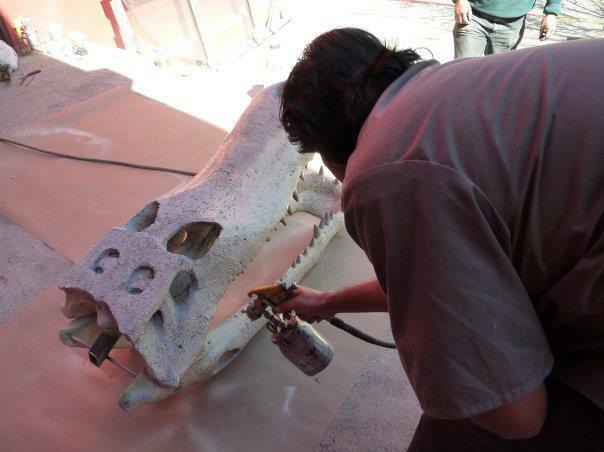 So Héctor and the rest of the prep team at the museum set about creating a mount for display and it was unveiled just recently. He’s been sharing his photos online and was kind enough to let me grab a few of them to post up here. As you can see there are in fact two, a whole body one and then a front half that lunges from the water at a rather blasé Tyrannosaurus. What is perhaps more interesting for some is the construction process of these mounts and not being one to write one post when I can eke two out of it, they will be following tomorrow. 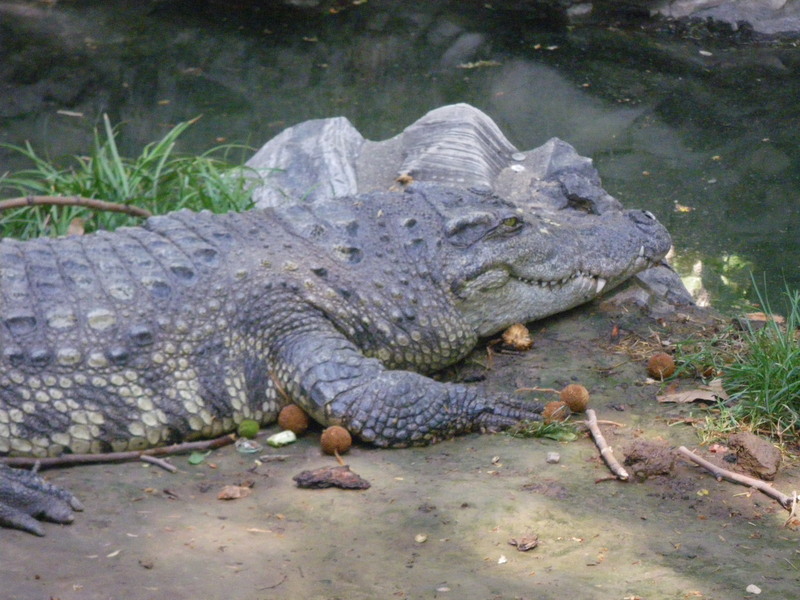 I have always liked crocodilians, but as a child only ever saw the odd large American alligator in a zoo or Nile crocs on TV. For a very long time I had no idea just how diverse the living crocodilians were and despite my interest in all things vertebrate would probably struggle to name more than a handful of species. A combination of getting to a lot more zoos, and zoos generally becoming more eclectic in their collections means that I have now seen more than a dozen species at one time or another (though only two or perhaps three in the wild). For a while I’ve been building up a collection of photos of various taxa with a mind to doing some form of identity quiz. Darren Niash planned to host it at one time, but the last time we mentioned it was two years ago now I think, so I doubt I’m causing him any great problems by doing it here. So, below the fold are a ton of croc photos from various zoos (sadly not all of them are great images for various reasons but should be good enough). Not all are different taxa (and nor are the photos of a given species consecutive), but there are around 10 different species represented here. Feel free to try and guess what they all are in the comments and more importantly, lots of crocs: cool! 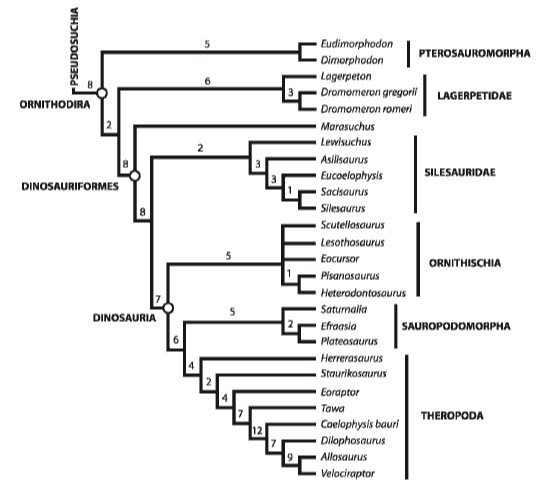 As I’m sure many readers are aware that Sterling Nesbitt has just published a monumental chunk of his PhD thesis as a major monograph on archosaur phylogenetics. While obviously new phylogenetic analyses are constantly being published, these tend to rehash and recycle existing work heavily (and that’s not necessarily a bad thing) and tend to be limited in scope. Very big, detailed, comprehensive analyses are incredibly rare since they require a huge amount of time to be applied to the problem. You have to have a really good understanding of anatomy, the historical aspects of taxonomy and phylogeny of the groups at hand, go over all the existing datasets, see tons of material, and then analyse and reanalyse and write it all up. To do all of that for a group as vast and complex as the archosaurs is a truly major achievement and he’s done it in incredible depth. Few of the results are perhaps really even remotely surprising, but that’s by the by. That gives us great confidence in our other, smaller, studies and tells us we were on the right track. More importantly, Sterling has thrashed out (as far as I can tell, it’s 300 pages long! and I’ve not read a fraction of it in detail yet) some of the more poorly defined characters and redefiend them and their states and then as a result of his work, redefined every major node on the archosaur tree. This is the real boon for me, making explicit statements about character evolution across the tree and allowing us to say more about what changed when and how and in conjunction with what else. The amount of characters too (over 400) also means that some important nodes now have a lot more support than they used to. 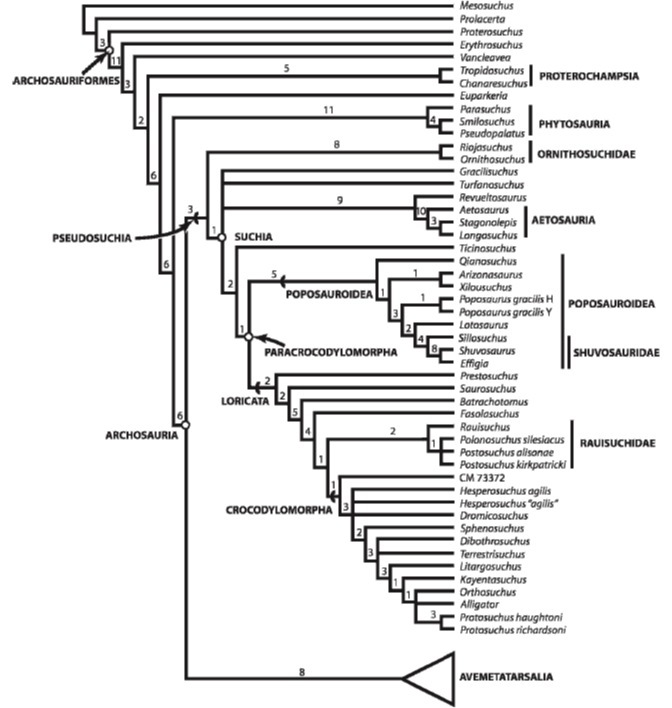 Archosaur phylogeny. From Nesbitt, 2011. And the rest of it. From Nesbitt, 2011. Obviously I’m especially interested in pterosaur origins, not least through having looked at some of the characters that tie them to the archosaurs with Sterling just this year. Some of these are disucssed and assessed here, but overall what we see is a much stronger support for an ornithodiran (that is pterosaurs + the dinosaursomorphs) position of pterosaurs than ever before. Sterling recovers some 12 characters directly the supporting ornithodia, (with perhaps 13 more depending on issues of transformation that I won’t go into here). That is, in the context of something this big, really quite a lot. In fact it’s as many characters as he finds to support the dinosaurs (also 12) and many more than supports the dinosauromorphs (just 5). In short, what has always been a very poorly supported node is, in this analysis, an incredibly well supported node. There are of course a few little caveats to this in that this is non a dedicated analysis of the pterosaurs and their relationships, and despite the huge size of this work, there are some more detailed and specialised characters that can be added in and there will doubtless be quibbles about exact codings and taxa. I can see a few things I would explore if I was to go and do this. That’s not to denigrate his work one iota (after all this isn’t what he’s trying to do! ), I’m merely saying that IF you were to use this as the basis of pterosaur origins, I think there’s more that should be done. However, this is very robust indeed as nodes go, and I think at the very least it adds a lot of support to this hypothesis where previously it had been rather less clear cut. The only thing I can really say to conclude is congratulations to Sterling and thank you. 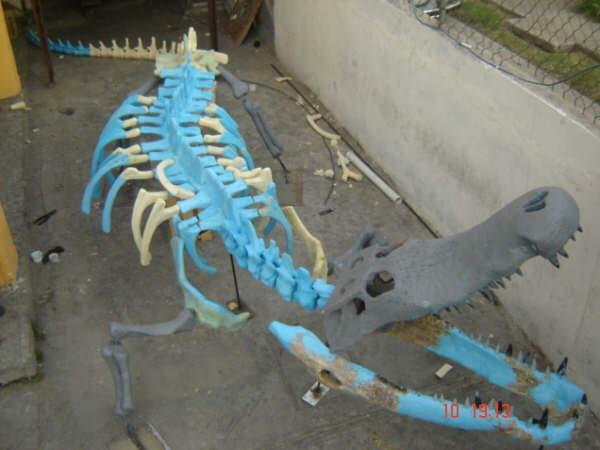 This is a piece of work which will aid almost every archosaur worker for, quite probably, decades. That is a real achievement. The two terms of the title are often used somewhat interchangeably (and I’ve been guilty of that myself in the past) but in fact they have rather different meanings, despite their close relationship. 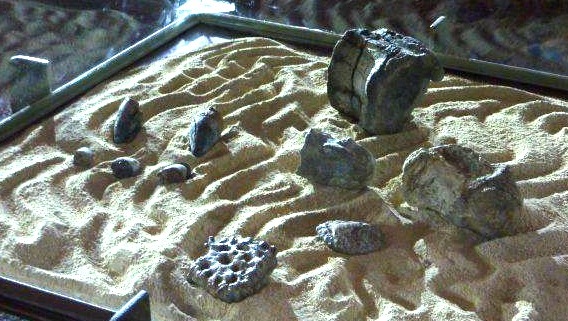 Here is a series of fossilised crocodile osteoderms that I picked up a few years back. The term osteoderm literally means bones in the skin and that’s exactly what these are, piece of bony armour that sit in the skin. Scutes on the other hand are the keratinous sheathes that cover the osteoderms. 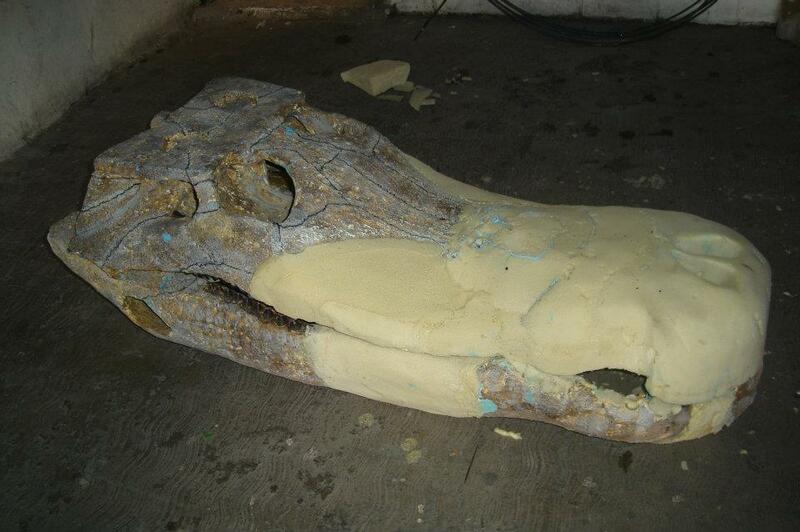 You can see some of these here in this croc with those bigger chunky scale-like pieces running along the back. That of course means all those fossil ‘scutes’ from things like crocs and ankylosaurs and titanosaurs should really be called osteoderms. In fact while of course claws and similar things do preserve from time to time, and there are bits of horn sheathes etc. out there, I’m not aware of any scutes being known from the Mesozoic (though not working on any of the more obvious groups, I could easily have missed them).